"Next time, it is my turn to be champion!" This is a translation of an article dated September 1, 1999. Ma Lin just won the mixed doubles title, and was the runner-up in the Men's singles at the Worlds. This interview is interesting in that Ma Lin was unusally candid. 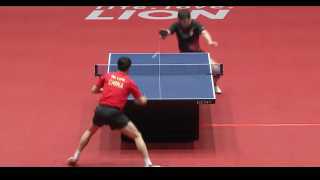 Ma Lin was born in Liaoning province in Northeast China, but heavily recruited by a table-tennis enthusiast to play in the then-new Shantao Table-Tennis School, in Shantao city, Guandong province. That school was started by an entrepreneur who paid for all the expenses out of his own pocket. It has been very successful, and its stars also include Tan Ruiwu, Liu Gouzheng, and Ding Ying. Ma Lin still plays for the city of Shantao, and for the province of Guandong. He joined the national team at 15, and has been playing very well, especially in China, since then. He won the Asian Cup when he was 16, and led the Guandong Mens team to victory in the national Olumpics in '97. He is now 19, and just won the Australian Open last month. Ma Lin returned to Shantao to attend the ceremonies that honored his achievements in the Worlds. This reporter had an exclusive interview with him. Reporter: When did you start playing table-tennis, and why did you come to Shantao? Ma: I started playing when I was six. The sports school recruited at my kindergarten. At that time my parents did not want me to play, because that would interfere with school work. But I thought table-tennis was a lot of fun, and my parents gave in after I insisted. At least it was good physical exercise, and would strengthen the body, they said. I came to Shantao when I was 13, because I felt that Shantao would give me more opportunities. The environment and everything else are better than in Liaoning, so I chose here. The facts proved me right. R: The Worlds was postponed this year, because of war. How did that affect you? M: (Laughed a little.) I should thank this war. I was not in condition in March and April. If the tournament was held then, I'm sure I would not have played well and would win nothing. I believe you would not be here to talk to me then. Because of the postponement, I got another 4 months to shape up, and my condition peaked at the tournament. R: Your match against Waldner at the Worlds was wonderful. Can you talk about that? M: I played Waldner three times: I lost twice and won once. Before that match, I had watched all the videotapes of Waldner maybe 7 or 8 times, and studied his every motion and all the details of his game very thoroughly. I knew how to adjust to him on the court. I believe Waldner had also studied me, and that was why the first 2 games he was dominating. At 11 to 16 in the 3rd game, all I was thinking of was how to change my strategy to get the last few points. I gambled that I should attack his forehand, since if I did not change I would lose. So I might as well play differently, and I played some points different than I ever played. My gamble won. I won because I believed in myself, and I was tenacious and did not give up. R: Before the tournament many people, including the media, favored Wang Liqin to win. Wang did not play to his level. What are your thoughts on this? Do you think you can take Wang's place? M: First let me clarify. Wang Liqin was not better than me. It was just that the media would praise an athlete on the basis of one major tournament. At the 8th National Games, I was second in Mens singles. Back then, the media said I was very good. Wang won the Paris Pro-Tour finals, so the media said Wang was the best. And now they say I have the edge. I feel that the media likes to compare 2 players in the reporting. Wang and I are at the same level, but the nedia has to say who is better; I feel that this is rather pointless. Through this tournament, I could not say I am stronger than Wang. But I could say for sure that I have an advantage that Wang lacks: the intelligence and the good mental game. R: In the 8th National Games you lost to Wang Tao by 2 points in the fifth game. This time you also lost to Liu by 2 points. You lost the title twice. What are your thoughts? M: It was a disappointing loss to Liu. At the critical point, I was not tough enough. In the first 4 games, I had the mental edge: Liu wanted so much to win the Grand Slam, and I had no such burden. But in the 5th game, both of us wanted that title. I started to play soft and play safe. Maybe it is fate. But next time if I have this chance, I will not play like that. It will be my turn to win. R: Kim Taek Soo was the number one penholder in the world. You beat him twice easily. Does this prove you are better? M: I have always tried to learn from Kim. Although we are both inverted penholder players, our styles are different. Kim plays the European penholder style: big motions, and lots of mid-table to far-table play. That style is very demanding physically. I concentrate on the first 3 balls: quick and ferocious, with backhand using the backside of the blade. From a techniques point of view, I am more advanced, and Kim's style is a little dated. The last two years he has been on a downhill. I should be better than him, because I am younger. R: What are your thoughts on the perceived table-tennis danger? M: This time we won all the gold and silver medals. To be honest, that does not help the development of table-tennis. These last few years, the sport had not progressed well. Many foreign players are not as well known in their own countries as they are in China. When they give top-10 athlete awards, table-tennis players are never considered. The foreigners would not pick table-tennis players, no matter what the accomplishments are. Just like Deng Yaping: even if she were to win a few more golds, she would never be a top-10 athlete in the world. So maybe we should not win everything. Maybe we should let other countries win some. Last edited by Michal_Z; 12-05-2011 at 12:01 PM. M: This time we won all the gold and silver medals. To be honest, that does not help the development of table-tennis. These last few years, the sport had not progressed well. Many foreign players are not as well known in their own countries as they are in China. When they give top-10 athlete awards, table-tennis players are never considered. I think what Ma Lin said here showed how the public awareness towards table tennis back then. In a way, this stunted the growth of TT in europe. I think the chinese nationals know more european players than the europeans themselves. Man its sad that somehow there is something hold him back from getting a WTTC Singles title. That is a really interesting interview, and he is right about the fame of players in their own country. When the Dutch national womens team won the EC for the 4th time in a row, they weren't even nominated for sports team of the year awards. To be honest I don't really feel that an award should mean anything as far as best athlete. No one takes this sport as serious as we do and that is where the flaw is. If people are concentrating on who's the better athlete rather than growing the sport it will stagnate, but if we were to grow TT to the popularity of China's level then of course awards would be given because we all know how incredibly demanding the sport is at the highest levels. What an interesting piece of history there. I doubt anyone can attribute the poor growth of popularity of global TT to what Ma Lin said. Biggest problem is cultural and institutional. Not really the problem isn't cultural at all. Or rather it isn't mostly cultural. The problem with growth is the lack of funding and resources. So in regards to growth the biggest problem is that most U.S. and Euro clubs prefer not to compete in a prized tournament due to lack of chances at taking the prize money. That in itself is a poor structure for building the growth of the sport. A player who is most inclined to win a tournament prefers to have less competition, but fails to see the bigger picture. If the whole point of the issue is because there is a lack of money and the competition takes away those chances you have to look at it more on growth providing larger prizes. So if you are most likely to finish in the top 2 or 3 prized positions would you rather win 1st with a prize of 1,000 or would you rather win 3rd with a prize of 10,000? See where it's going? Too many people are so insecure and selfish that they don't see the bigger picture. The larger the prize money the more growth and more competition, but by looking into the final result it's far better. Imagine if instead of the final 16 breaking even that the final 32 could. The larger the clubs the larger the amount of sponsors. Instead of Butterfly and DHS haveing a dozen sponsored players why not a hundred? Not to mention that the larger the growth the more companies created. Imagine a company such as JM Blades growing to the same level as Butterfly or instead of a dozen brands out there there were 100. It's all about growth guys and gals. It's so simple and cheap to get someone into the sport it's only expensive because people fail to have vision for what could be instead of what is.